We are a family of 6 who are frequently on the go. I would like a vehicle that will last me a long time--I drive them until they fall apart. 2nd and 3rd row comfort is exceptionally important. I would like to be able to tow our pop-up camper or future hybrid camper. I have looked at used Chevy Traverses and Ford Expeditions. I like both of them. I would like to look at some of the other large models as well. The vehicle MUST seat 8 as I often have additional folks along. I don't really care about bells and whistles, and I am really not crazy about the large LCD screens in some of the newer models. Thanks for the input. A pop up camper that sleeps eight with AC and awning is over 4,000 lbs. On the SUVs you'll need the already installed towing package as some of thr base models do not have included to get the full 4,500-5,000 lbs of towing capacity, minus occupant and cargo weight. That pretty much narrows your choices to habit a half dozen full size suvs. If you want ensured reliability, the Toyota Sequoia is your best bet. It isn't the most comfortable ride, but the engines are bullet-proof and it has a good tow rating. I know several people that love their Sequoias and they all have over 200k miles. They hold their value, which isn't a good thing when you plan to buy used and run it to the ground. There is the Chevy Suburban. It is reliable, but the engine is not as durable as the Toyota. It is more comfortable than the Sequoia and the 2015+ Suburbans have a nicer interior compared to any other large mainstream SUV. The Ford Expedition is my least favorite because of how old-feeling it has always been. All these cars are pretty reliable because they are not filled with fragile bells and whistles and new engine technologies. If I was in your situation, I would get a 2008+ Sequoia because of the great reliability and 5.7L V8. I would also consider the 2015+ Suburban/Tahoe or GMC Yukon XL/Yukon because the interior is so much nicer. 2007-2014 Yukon has notorious problems with excessive oil consumption in the 5.3L V8, mainly in the 2007-2010. The 2015+ GM SUVs' A/C sometimes stops working, but there are not enough issues to make it a big deal. There have been no consistent problems with the Sequoia or Expedition. I recommend getting something with a body on frame chassis. This means a truck body. The Traverse is a unibody platform, like a minivan. The powertrains in these unibody SUVs are not meant for towing often and could lead to transmission failure and a blown engine if pushed to the limit for longer periods of time. The unibody SUVs are almost always more comfortable and quiet, but towing capacity and space are usually compromised. For these reasons, if you were not going to tow or off road, I would ONLY recommend a unibody platform SUV. I would avoid a Traverse, Acadia, or Enclave. I'm not seeing Toyota Sequoia as a superior in holding their value going back to 2008 Platinum vs Chevy Tahoe LT. Both can be had in 2wd for $45K and 10 years 120,000 miles later sell for the similar $18,000-19,000. That is not very good value for a Toyota when compared on cars dot com. 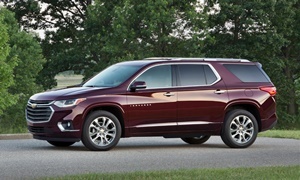 Plus Sequonia only sells 1,000 a month so dealers might not negotiate compared to a much more popular Tahoe or Yukon. 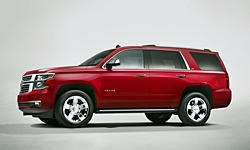 I compare the Tahoe and Expedition in this review. 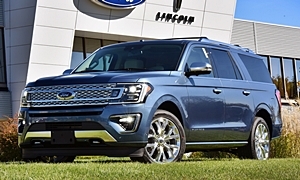 I agree with LectroFuel that the Expedition feels old. But one thing in the Ford's favor is a much roomier and more comfortable third row, if this matters to you. The third row in a Tahoe is very tight and uncomfortable. The Suburban's is okay, but still not nearly as good as the Ford's. Outward visibility is best in the Ford--huge windows. If fuel economy matters, the GM SUVs do better than the others. If reliability matters, while I'm sure many people have good experiences with all of them repairs are most likely with the GM SUVs--the current generation or the previous one. The Ford is more reliable than the Chevrolet, and the Toyota is more reliable than the Ford. Nissan also offers a large SUV, the Armada, but I've never heard great things about the first generation (the new one is a totally different vehicle). We have no reliability data on them. Like the Ford, the first-gen Armada feels old. Like the Ford the Nissan has an independent rear suspension, which enables more space for passengers and cargo, but I don't think it's as roomy in back as the Ford. I truly appreciate all of the helpful input I have received from you guys. I have looked at several of these vehicles in person now. I will give the perspective of a mother of 4 kids who are not babies/ toddlers but still many years off from driving themselves. Here goes my review of third rows/cargo areas. These are really attractive vehicles, but the 3rd row is ridiculous. No one taller than 40 inches can sit there comfortably. Also the cargo room with all three rows in use is pitiful. I didn't even test drive it. The rest of the vehicle is very nice. The interior is beautiful. I can see why people prefer it to the Expedition-especially up front. At first the third row looks promising. Then my nine-year-old gets in the 3rd row behind one of the second row seats and asks Where do I put my feet?" The second row seats do not move forward. I don't know if this is customary across all Suburbans, and I would like to find out. So, I didn't test drive it either. This was a new vehicle. There seems to not be a lot of used Suburbans in my area except really old ones, which I assume speaks well for the vehicles. Here is the obvious 3rd row winner. However I think for a large family only the EL would work unless you don't mind having everyone ride home with groceries in their laps. That said, 3 larger kids across in the 3rd row actually works, and I liked that the 2nd row could slide forward to give additional leg room. The vehicle drives fine as most newer vehicles do. The Bad: I really don't like the front passenger area of the vehicle. I felt like I had to reach around the shifter to access the climate controls, and there were too many buttons. Also, the center console is huge, but offers very little space. There is no place to put my purse except the passenger seat or the floor in the passenger seat, which is awfully far away from the driver. The vehicle is nice, but definitely not as nice as the inside of the Suburban. I am hoping to see an older model without an infotainment screen. Maybe it won't have so many buttons. If I didn't need to tow ( and we are RV'ers/campers), this would definitely be a contender. There is both kid room and grocery cargo space. The interior styling is nice enough particularly when considering the cost difference between it and an Expedition, Tahoe, Suburban, etc. 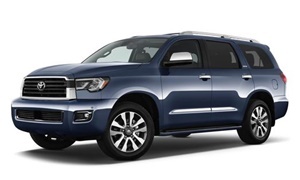 I hope to get to check out the Toyota Sequoia today or tomorrow. I just found one in my area. Right now my best option is the Expedition. Maybe a 4-year lease on the Ford so you can work on the less than the largest in 4-years? We had a full size conversion can growing for a family of four. It worked great for hauling kids and cargo out state for sports over night. I just wanted to thank everyone for all of the wonderful advice. I did get to drive a Toyota Sequoia the other day. I liked it more than I thought I would. It does seem a bit bulkier than the Expedition, but the kids really liked the seats which is a plus. The only thing I didn't like was the little 18.9 cu ft behind the 3rd row. 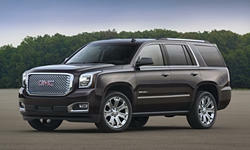 I am hoping to check out a 2012 -2014 Suburban with a second row bench seat. I need to be able to seat 7 kids a few times a month. 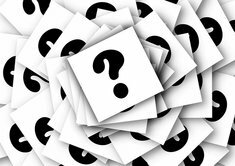 I will eventually post with what I get, but I am really slow to make decision. Also there is not a lot readily available in my area right now. I will update again then.